On the File tab (Microsoft Office Button in Excel 2007), click Save As. To save to a Web page and create supporting files and folders, select Web Page (*.htm; *.html). If you already selected the item that you want to save, click Save, and you are finished. Otherwise, continue with the following steps. To save the entire workbook, including tabs for navigating each worksheet in the workbook, click Entire Workbook. To save the current selection on the worksheet, click Selection: Sheet. The Publish As Web Page dialog box is displayed. Select Entire workbook. The entire workbook is saved, including tabs that a user can use to navigate to each worksheet. Select Items on Sheetname, and then select All contents of Sheetname. Select Items on Sheetname, and then select the item that you want to save, such as a PivotTable report or a chart. Items do not include ranges of cells. Select Range of cells and then, if the selection box does not contain the range that you want, click the worksheet (the dialog box will collapse to a selection box), select a range of cells from the Excel workbook, and then click Expand Dialog . Select Items on Sheetname, and then select Chart x. Select Items on Sheetname, and then select the AutoFilter item that you want to save. Select Items on Sheetname, and then select the Query item that you want to save. To republish a worksheet or item that you have already published, select Previously published items and then select the worksheet or item that you want to republish. To prevent an item from being republished, select the item and click Remove. To continue publishing, click another item in the list. To add a title that is centered over the selection and in the title bar of the browser, click Change under Publish as. Type the title that you want, and then click OK.
Next to the File name box, click Browse, and locate the drive, folder, Web folder, Web server, HTTP site, or FTP location where you want to save your Web page, and then click OK.
You can also choose an existing Web page to append to or replace as long as you have permission to modify the Web page and have access to the file. TIP: When you first create your Web page, it is a good idea to save the Web page on your local hard drive so that you can make any changes or corrections that you need to before you publish the Web page on a public or shared location. To view the Web page in your browser after you save it, select the Open published Web page in browser check box. NOTE: To preview the page without saving it you can use the Web Page Preview command, which you can add to the Quick Access Toolbar. If you expect to make changes in the workbook later and want to automatically republish the items each time that the workbook is saved, select the AutoRepublish every time this workbook is saved check box. To change Web page options, click the arrow next to Tools, and then click Web Options. For more information, see Web Page options. To change picture compression options, click the arrow next to Tools, and then click Compress Pictures. For more information, see Reduce the file size of a picture. To copy over the existing page, click Replace file. To append your data to the end of the Web page, click Add to file. If you often need to export your Excel tables to HTML, the standard Excel means we have just covered may seem a bit too long way. 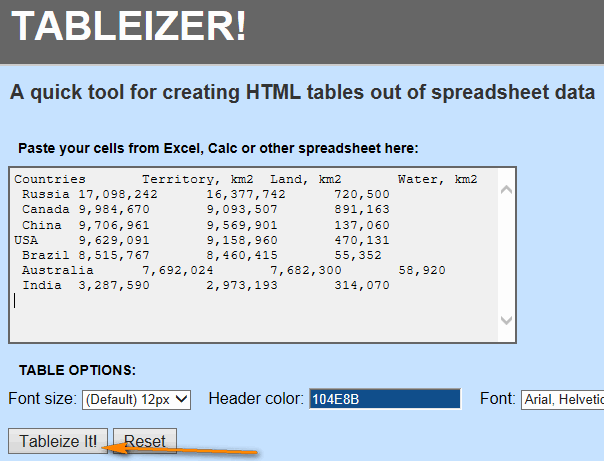 A faster method is to use an Excel to HTML converter, either online or desktop. There are a handful of online converters on the Internet both free and paid and we are going to try a few right now. This one-click online converter handles simple Excel tables with ease. All you need to do is to paste the contents of your Excel table to the window and click the Tableize It! button. Some basic formatting options such as font size, font type, header color, and even CSS styles are available. After that you just copy the HTML code generated by the Tableizer converter and paste it to your webpage. The best thing when using this tool (apart from speed, simplicity and no cost : ) is the preview window that shows how your Excel table is going to look like online. 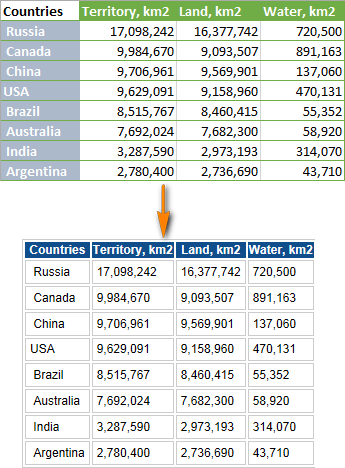 However, the formatting of your original Excel table will not be automatically converted to HTML as you see in the screenshot below, which is a very significant drawback in my judgment.